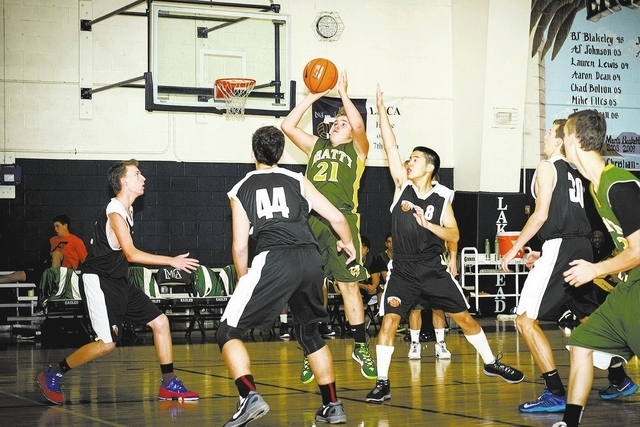 The Beatty Hornets Men’s basketball team went to the Lake Mead Classic on Saturday in Las Vegas. The team went 0-3, but with each game showed some improvement. In the Tourney they played three games and lost to Lake Mead 44-18, the Australian National team 57-44 and Word of Life 58-51. Hornets Coach Joe Serrano says his team calmed its nerves after the first game and settled down. “It was the very first game of the year and everyone was a little bit nervous and they pulled away from us in the first half, (Lake Mead) during that game we got out-rebounded, had 29 turnovers and only 39 shots. You can’t expect to win taking only 39 shots,” he said. The second game Serrano wanted his team to relax and concentrate on fundamentals. Serrano believed his team was in the game during the second game. They lost to an Australian team by a close margin. “We got better on the turnovers in the second game with only 21. We should have won that game. We were up by six in the second half but got into foul trouble. I had four guys with four fouls with four minutes left in the third quarter. That is four of my five starters and the other team pulled away,” the coach said. In the third game against Word of Life, Serrano said his team was also competitive. He said they were down by 9 points with just four minutes left. The team was getting some stops and only down by three with a minute left and ended up losing only by seven points, the closest margin of the day. Serrano believes he saw a lot of improvement during the tournament. Beatty is away at Trona on Dec. 14.